3-4 year old children are old enough to be prepared for basic education that will prepare them for higher education. 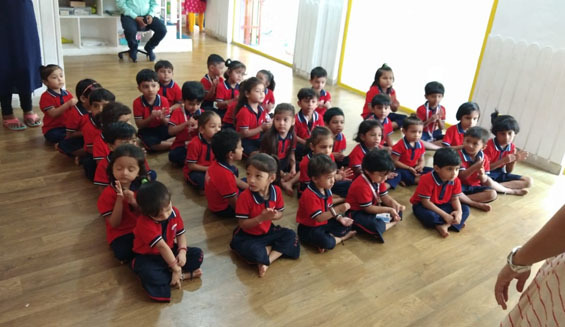 Our nursery programme is equipped with the best syllabus to suffice all your child’s intellectual and physical needs and prepare them to receive the future education that will be imparted to them in the right way. Preschoolers get formal schooling setup as per national educational guidelines. 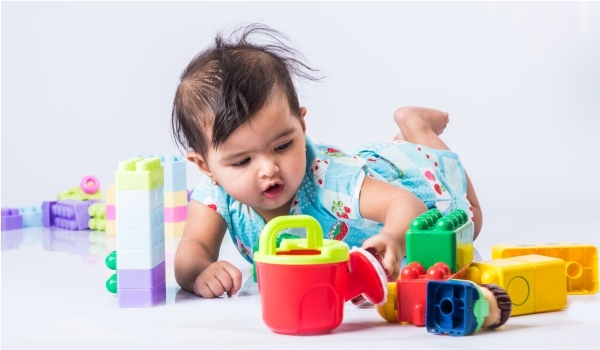 Understanding the age-specific concepts by actively participating in Montessori Labs ensures that their analytical abilities, probing techniques, personality and individuality are at par with the global Montessori students. We at CMPS also focus on diet of the child and make sure to give them the right diet for healthy growth and keep their physical development on course. You can also give us exceptions and additions to your child’s diet based on your child’s conditions (allergies, etc.). Reading, writing and speaking become easy for kids with the help of our advanced curriculum devised with the input of our international experts on Montessori. Children learn the basics about writing, reading, phonetics and such. We also teach children the English alphabets where upper and lower case letters and sentence structuring like “I am a girl/boy” must be used. We also intend to build the child’s vocabulary through storytelling and other fun methods. We teach children basic numbers and mathematical concepts with fun practical teaching approaches, the basic concepts including comparisons, addition, subtraction and basic operations. We also teach children the names of shapes and colors and have them identify them in a series of games and activities. We also give special teaching and information through visual PPT’s and do engage in conversation about unsung heroes in India. This includes knowledge about their body parts (i.e. their names, basic functions, etc. ), names of seasons and the specialty of each, transportation (air, water and land), names of animals, fruits, vegetables, places, etc. Colors and shapes, awareness about good eating habits, saying ‘No’ to junk food, eating healthy food, importance of greenery, planting trees, general conversation about various seasons like summer, monsoon, etc., road safety and traffic rules, discussion on good health and hygiene, self grooming, use of dustbins, importance and purpose of animals, discussion on respecting and protecting animals and birds, basic manners like using thank you, please & sorry and differentiation between living & non-living things. Cambridge Montessori Pre School is the best option for your child’s preschool needs. We hire the best operating staff that is well-versed in child care and has experience in teaching a curriculum similar to ours to ensure the child gets most out of his/her time with us. If you’re not convinced, you’re always welcome to come in and check if we are truly the best hands to place your child in. 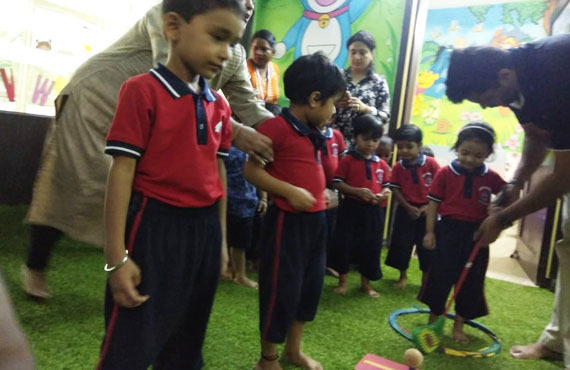 LKG or Lower Kindergarten is the initial level of education for children as LKG is the class which starts creating or changing the personality of a kid from the roots because the kids go for the first time alone in the powerful world which is full of obstacles and hurdles. LKG is the very first step in the system of education and we all know that education is a never-ending journey. Kids are sensitive and it is their first time going alone without their guardians, so it is our school staff’s responsibility to make them feel comfortable in our school environment. That is why, Cambridge has well-trained staff under supervision who is trained to treat the kids in a wonderful manner and make them learn new things by doing or arranging some playful tricks. Our school believes that guiding such a small kid who is not properly prepared to run, jump or to utter is a tough task. That is why, we plan to guide them with games and we know that extracurricular activities are at the heart of kids and if we start teaching them by using this trick, it will definitely lead to success. You know what? 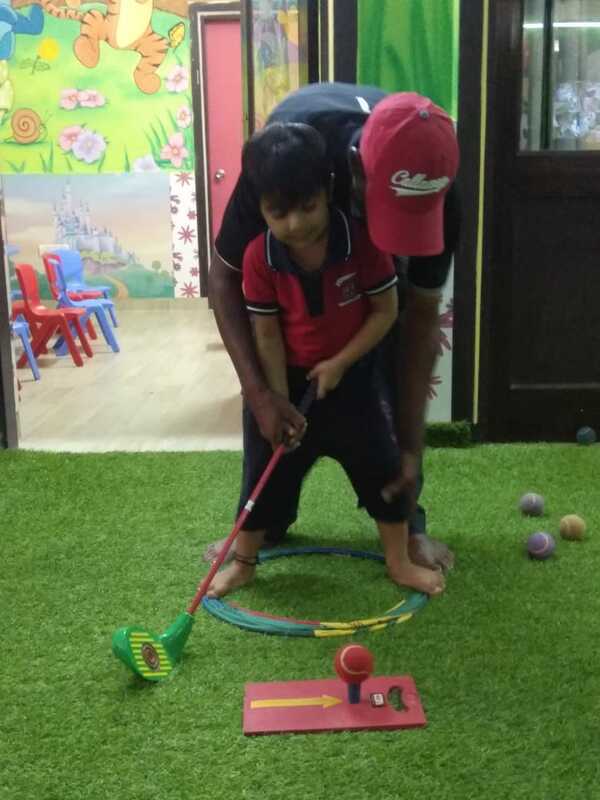 LKG is the most essential part of a student’s life because it is this stage at which kids start turning into students and it is this stage that makes them learn the basic manners and skills for the upcoming life. Moreover, the skills like communication, mathematical or learning skills that exist for a long time are the main goals of LKG class. Our school tries to create the vigorous personality of kids as after LKG, they enter into the next level of education which is tough if a kid is not well trained in LKG. LKG teaches a kid basic education which includes “Mathematical Numbers”, “Alphabets” and “Basic Poems”. More than that, a kid gets prepared to tackle his/her own world without any support. LKG prepares a kid to handle situations very easily. Moreover, when a kid enters into the new world of education and into a new school with new friends, it is very important to make a good circle of friends and now it is in the hands of the student to make friends by using their communication skills. It now depends upon kids, what kiddish zone of tricks they use to make friends and it is the very first time they start building their own world of right and wrong. That is why, LKG is important in a child’s life because of the beauty of long-term learning by crossing every hurdle on their own without taking help from their parents. 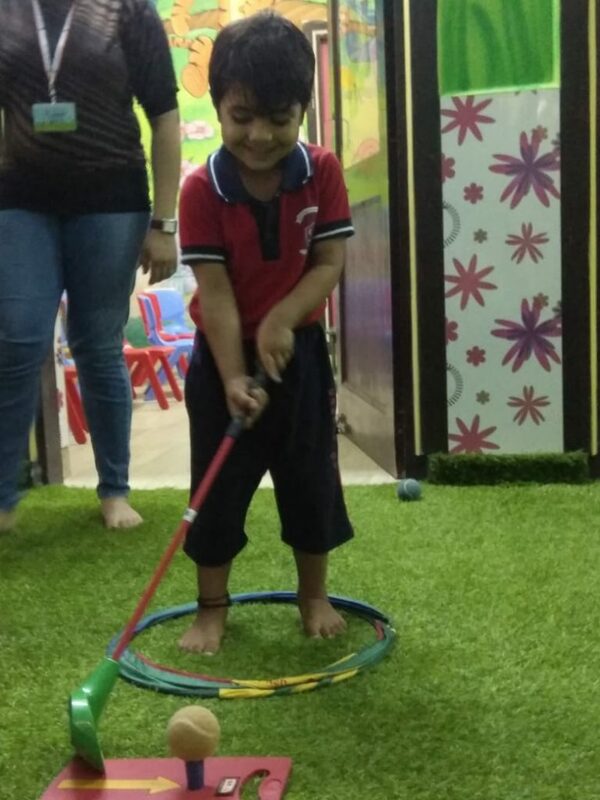 LKG is the best primary level of education and we know it as a fact because it is the very first level of learning by breaking all the obstacles of shyness and they enter into the world of school along with a responsibility on their shoulders. UKG stands for Upper Kindergarten. It is the next level of education and in this stage children become responsible for new things and new responsibilities and we think in UKG, kids start becoming students. UKG is the initial level that is accomplished with social behavior which is essential for a student to learn in a school and in UKG students start their own safari with a lot of things to learn on their own. UKG includes all the basic manners like how to sit in class, how to talk to the teacher and how to respond to the situation in a school manner and now the student is completely out of their kid zone. UKG syllabus is larger than LKG as the student jumps from initial level to primary level and it is quite obvious. NUMBERS, ALPHABET, POEMS and even STORIES are counted as part of their syllabus. Moreover self-confidence and self-esteem get stronger and polished in UKG. In UKG, communication of learning begins between the students and now they start talking with their friends related to studies. UKG also shows the spark of competition between students because they start understanding that a stage has come where they compete with each other. UKG has an area of development up to the highest level because in UKG a student gets trained with visual discrimination, safety rules and sense of security which is an important lesson. UKG is the complete phase of development for a student and is accomplished with various stages like personal, social, emotional and cognitive which play a vital role in life and are quite important to let them handle situations on their own without taking an aiding hand from anyone. This stage is full of learning with a bit of responsibility. UKG is the phase of learning with aesthetic sense and trains them to grab the opportunity in a positive manner. It is the class where children start growing on their own by grabbing things from surrounding and start recognizing what is good for them and what is bad. UKG also guides them in “Theme-Based Concept Time” along with extra-curricular activities in which a child is responsible to score highest in exams and tests as the spark of competition gets enlightened automatically. We think every school knows the pros of UKG and even the parents and we utterly believe that every phase has its own sense of power to make children responsible for the next phase of education. Education is a ladder in which every step is fulfilled with new learning and knowledge and has its own importance in a student’s life. So, we must say that every stage of education has its own importance and same is for UKG. 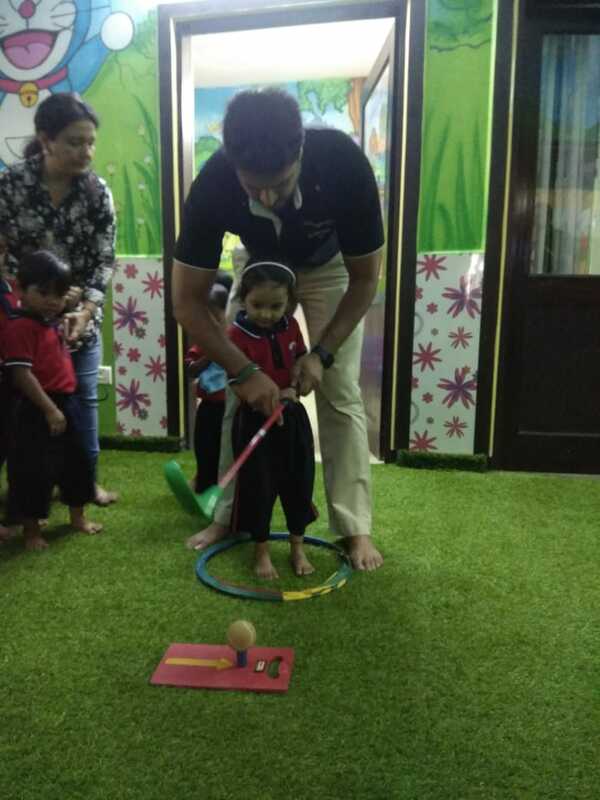 Cambridge Montessori Pre School initiated a unique concept by introducing golf techniques to our little hearts. 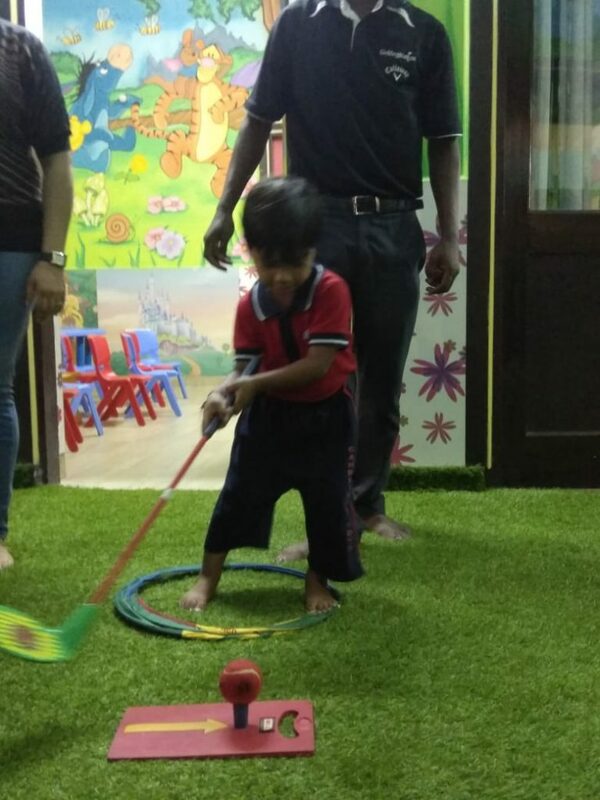 We would love to see our preschoolers to be the golf leaders of tomorrow. We call them “Golfy Tots”. When you walk a course and carry your bag, you are participating in a low-intensity workout. Tiny tots can learn to carry a small golf bag without burdening their small bodies. Also, they build muscle, get fresh air and spend time away from video games and television. Unlike other sports, where children may incur injuries which can be serious, golf does not pose those risks. Although injury can happen, but it won’t come from your child being tackled by another child in a rough and aggressive sport. Golf can be played with friends, family members or even solo thus making it a fun way to build relationship and memories. Golf has a lot of rules and children need to learn how to follow them. Although they don’t have to learn all rules in the start but going by rules will help them to be focused and disciplined.